Every year, my friends and I watch the red carpet pre-show at the Oscars together. We eat, we laugh, and we take joy in ripping apart the fashion fails and fawning over the sartorial successes. During the host’s opening monologue, we watch in relative silence (because true silence is impossible with us), and roll our eyes or chuckle at the jokes. We cringe during the awkward moments and have impassioned debates about which actress should have gotten the big prize. And, while all of this is fun for us, it’s not super thrilling for the kids. 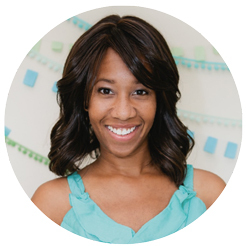 But this year, they can have their own little Oscars bash inspired by one of their enduring favorites, Frozen. They can enjoy sugary treats, pose for paparazzi in a cute photo booth, and play a game or two while my homegirls and I discuss earth-shattering events celeb fashion. 1. Whip up themed treats. Snowgies hit the scene in Frozen fever, and my girls were excited to get another glimpse into Elsa and Anna’s world. It was great to see Olaf again, but these round, lovable little snowballs were an adorable addition to the cast. Luckily, they’re also easy to recreate in cupcake form. 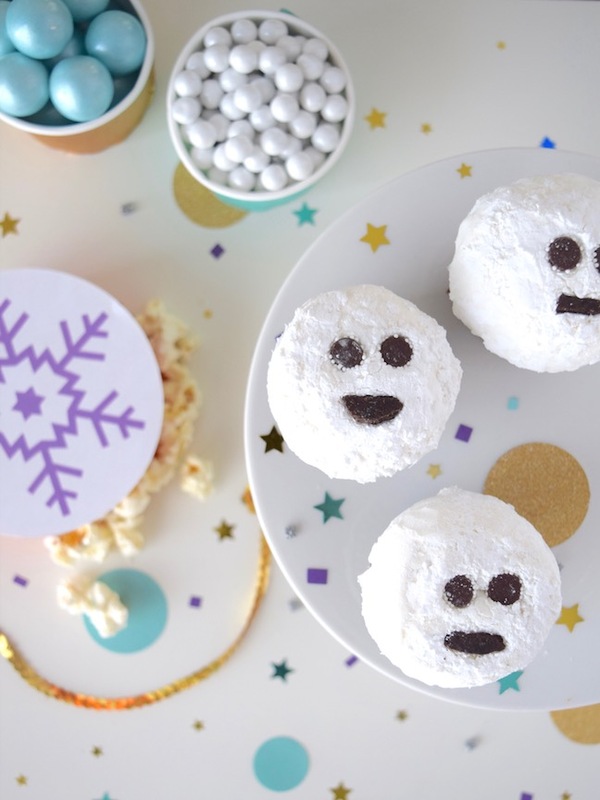 Simply dip the top of a frosted cupcake into powdered sugar, insert two inverted Sno-Cap eyes, and add a broken chocolate sandwich cookie for the mouth. Just like that, you’ve got a snowgie cupcake! 2. Incorporate lots of fun details. 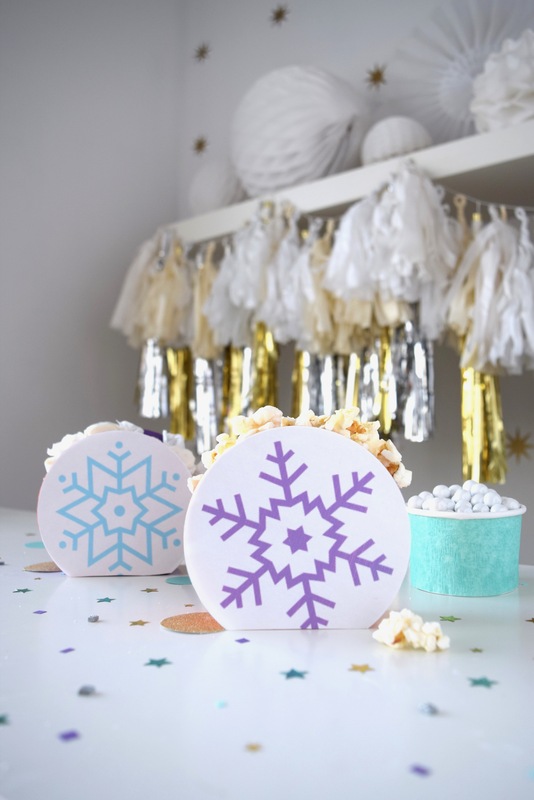 A snowflake-adorned favor box is perfect for holding candy or popcorn to treat your VIP guests during the awards ceremony. 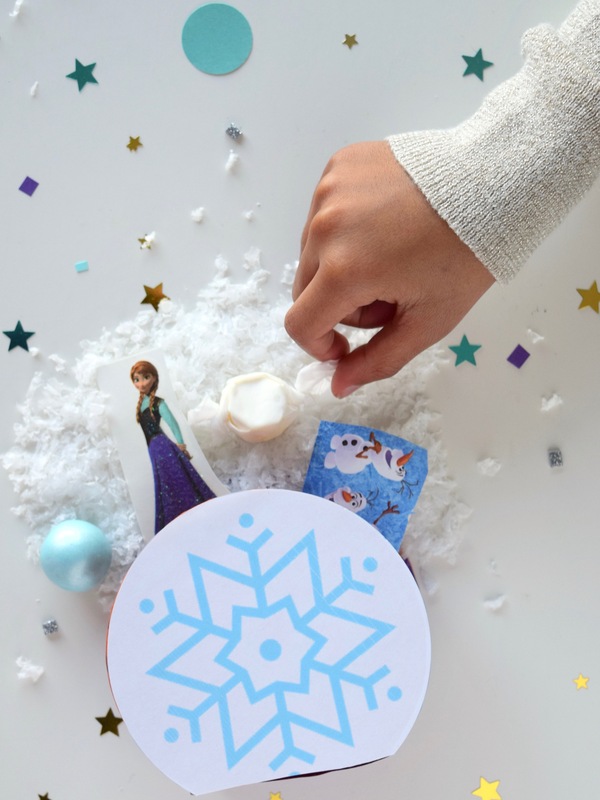 Download the Frozen Oscars snowflake popcorn box to make your own. 3. Make those snowflake boxes do double duty as favor boxes. 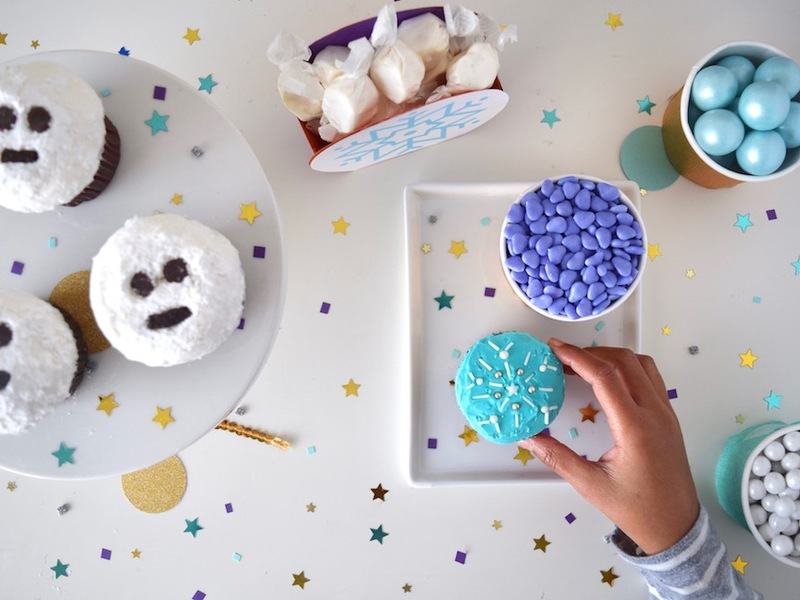 Stickers, tattoos, candy, and a handful of faux snow will make the night bright. 4. Put a fresh spin on Oscar. 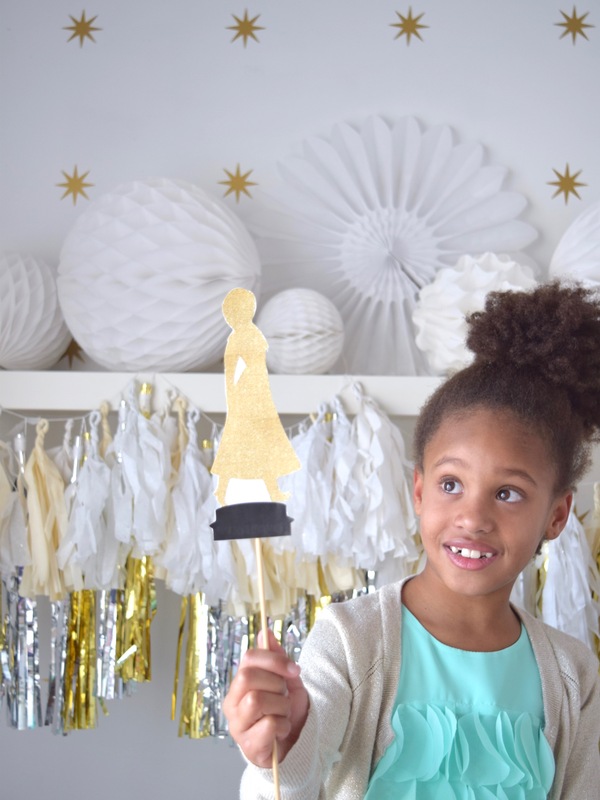 With this party theme, an Anna-shaped Oscars statue is a must-have photo booth prop for those after-ceremony interviews and photo ops. 6. 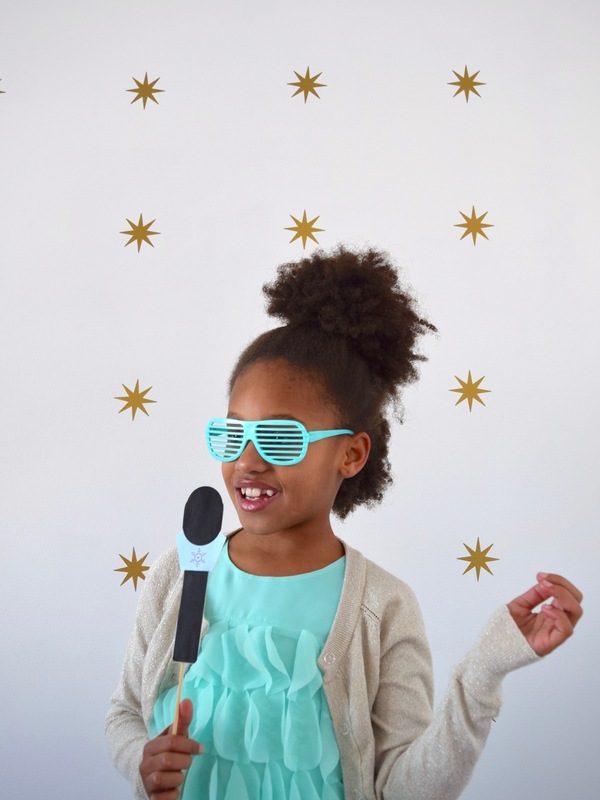 Decorate your photo booth with removable, reusable vinyl decals. I used gold starburst decals, which look like a retro, yet modern, twist on snowflakes and nicely represent all that Oscars gold. 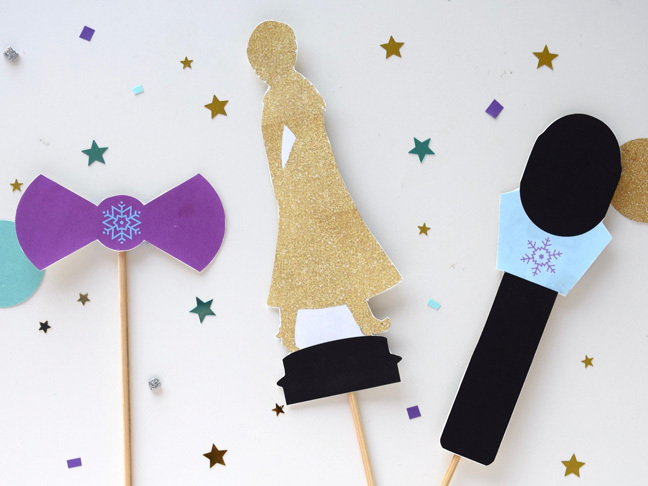 And don’t forget to download our Frozen Oscars Party photo booth props for your kiddo’s bash! 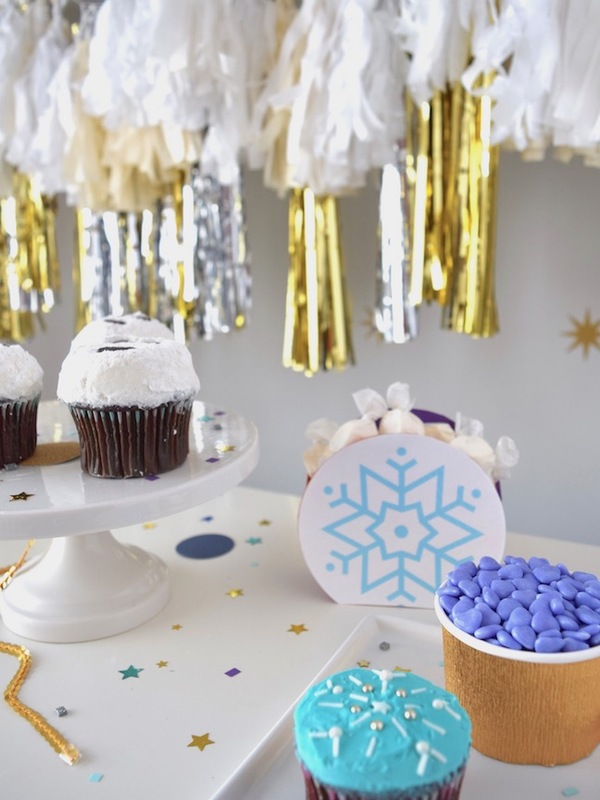 Enjoy your wintry, wonderful Oscars party inspired by Elsa, Anna, and the whole Frozen crew!